Complete Renewables continues to grow on reputation, offering a package you'd expect from a national company with the personal attention of a local business. All surveys and quotations are carried out by an MCS qualified and experienced installer to ensure the most suitable system is proposed. With competitive pricing and a reputation to be proud of, Complete Renewables should be on your short list. Complete Renewables are members of the Renewable Energy Assurance and work to their strict rules on presentation and performance estimates. A comprehensive estimate will be provided with the detailed formal quotation. Warranty is very important to us, we only sell products with 10 years warranty from manufacturers with a brand we can rely on. We offer a market leading insurance backed warranty for our workmanship giving our customer's peace of mind. We are very proud of our work and we are pleased to provide references from our many satisfied customers. We don't use subcontractors, we have experience and professionalism you can count on. Finally, a level D energy performance report and compliant wind/structural load report will be required for the feed in tariff application, Complete Renewables carry out both these surveys prior to the installation. Should either present a problem resulting in you choosing not to continue, there will be no cost to you what so ever. Very professional, work was carried out with no issues, after care support is excellent. Would recommend. Clive was the first person i saw and set the standard for those to follow.None reached his standard. I would give him 6 out of 5 if I could for all 6 sections. His knowledge was excellent. I did my own research and he knew all i had found out and much much more. I got from Clive, the installation i needed rather than what others wanted to give me and at a reasonable price. I am absolutely certain that, for technical reasons that i will not go into here, Clive's array will work much better than those offered by other companies I would not hesitate to recommend Clive and Complete Renewables Ltd to others and i hope that the work he has done for me is the springboard for many more jobs for him in my area which is devoid of Solar PV at the moment for some reason. Probably because they have not met Clive!!!! I liked the clear and professional way that the terms and conditions of the installation where explained to me so that I felt comfortable and confident in deciding to place the order. 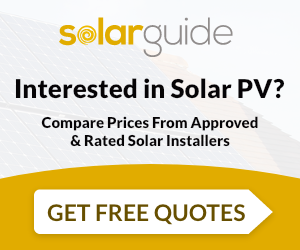 I would not hesitate to recommend this company to anyone considering installing solar energy. Pleasant company to deal with. 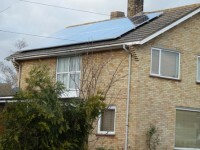 No hard sell just plain english suggestions for a PV installation. Workmanship to a high standard. Would recommend Complete Solar. I found Clive Rolison and his workers to be most competent and professional. He was amongst the most knowledgable of the technical estimators who made site visits (and six companies, both large and small, were invited), and was able to answer all my questions regarding the installation. It is not a large company and gave a very competitive price which I accepted. 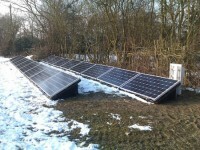 The work (a 3.5kW system) was carried out over three days with minimal disruption using solar panels of my choice. 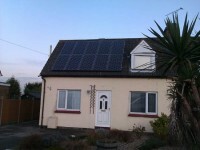 It was a plus point that the workmanship and the SMA inverter are guaranteed for 10 years. I have no connection with Complete Solar apart from being a satisfied customer. Gwynn DAVIES. Great Dunmow, Essex. 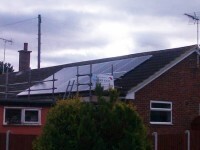 Complete Renewables Ltd are MCS accredited engineers who undertake installations of Solar Water Heating and Solar PV. 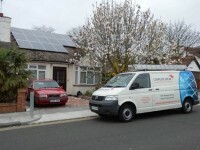 For similar installers in this area please visit the Chelmsford solar page. "Very professional, work was carried out with no issues, after care support is excellent. Would recommend."